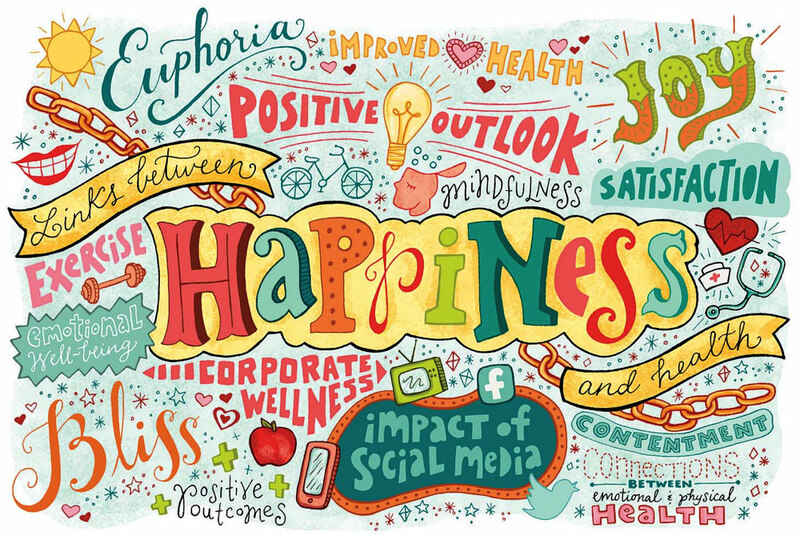 Can Happiness Make You Healthier? VIsit the Lee Kum Sheung Center for Health and Happiness website. In the quest to study human happiness, including its causes and effects, even agreeing on a definition is a formidable undertaking. Joy, euphoria, contentment, satisfaction—each of these, at times, has been used as a proxy or emphasized in research studies. Studies that probe the link between happiness and health outcomes are still relatively rare in scientific work, but the new Lee Kum Sheung Center for Health and Happiness at the Harvard T.H. Chan School of Public Health aims to change that as it pursues a new approach to health maintenance: focusing on specific factors that promote the attainment and maintenance of high levels of well-being. In this, the center represents a sharp departure from traditional medicine that focuses on risk factors and treatments for disease. Among the center’s first goals: to catalog and standardize the measures used to describe and evaluate happiness and related factors. “There are more than 100 different measures already in use for the various forms of well-being,” says Laura Kubzansky, the Lee Kum Kee professor of social and behavioral health. “And it may be that the instrument we need for our research does not yet exist.” Happiness, after all, is a term that encompasses physical, emotional, and social factors. Although the different facets of well-being frequently occur together, measuring one does not always shed light on whether the others are present; thus, different measures may be needed to capure these distinctive facets. The researchers also hope to solidify evidence that emotional health influences physical health, and not just the other way around. This notion was challenged last year, when The Lancet published a study finding no connection. But critics (including Kubzansky, who coauthored a letter of response in the same journal) took issue with the study’s methodology, noting that in adjusting for self-rated health (which is partly defined by emotional well-being), the study’s authors essentially adjusted for the very factor they were trying to investigate as a predictor. The debate exemplifies the tension underlying research in this area: the public seems to find the subject enormously compelling, but some segments of the scientific community remain skeptical. Kubzansky and her colleagues aim to amass enough evidence of biological connections between emotional and physical health that eventually the link will be taken for granted, much as exercise is generally regarded as beneficial. Yet even if that link is established, how can it be applied? If some people are innately happier than others, are the latter doomed to ill health? To answer such questions, the researchers seek to identify social policies that may be relevant as well as to test interventions with the potential to increase happiness: exercise, mindfulness, and cultivation of a positive mindset, for example. Other studies will aim to establish best practices for corporate wellness programs by testing their efficacy. Another prong of research will be led by Kasisomayajula “Vish” Viswanath, Lee Kum Kee professor of health communication, who studies the impact of movies, television, advertising, and social media on health and happiness. For example, watching or reading news with a focus on negative events such as war, terrorism, and crime may influence people’s sense of well-being: “If you feel that the entire world is coming apart, that affects your emotions,” says Viswanath. Researchers will also investigate how media can be used to positively influence happiness and health. Research about happiness gets headlines more readily than grant funding. Kubzansky notes that to date, her projects—including studies of veterans that link post-traumatic stress disorder with poor heart health and a positive outlook with improved heart health, and studies of older men that link hostility with diminished lung function—have capitalized on existing data. That allowed her to conduct work on this topic without the level of grant support that an original study design and data collection would require. That is why the $21 million underwriting the new center—a gift of the Lee Kum Kee family, whose Hong Kong-based companies make products such as sauces, condiments, and herbal supplements—is critical to investigating the relationship between happiness and health. Such research represents a paradigm shift, Viswanath explains, and that has been one reason for funding challenges. Until very recently, he says, “We have always treated health as the absence of disease”—and the existing funding framework for both government investment and private philanthropy focuses principally on understanding and preventing specific diseases. The new center will focus instead on factors that can lead to positive outcomes. “Unhealthy lipid profiles, high blood pressure: these are biological processes that have been shown to lead to poor health,” says Kubzansky. “The question is, are there biological processes that we have not yet identified, or that we don’t characterize well, that lead to better health?” She and Viswanath envision the center as a place that brings together researchers from Harvard and beyond, complete with funds for pilot-testing ideas that may generate the initial data necessary to obtain support for full-scale studies. “People focus on problems because that’s what catches our attention, and people want to solve them,” says Kubzansky. But she is optimistic that the culture will begin to shift, thanks to the new center: “My hope is that with a convening platform to pull people together, we’ll be able to change how people think about health,” and how to maintain it throughout their lives.